Thirteen years later, the classic FPS-RPG is still going strong with a fresh dozen hours of content. The modding scene is one of the greatest boons of PC gaming for creative types. 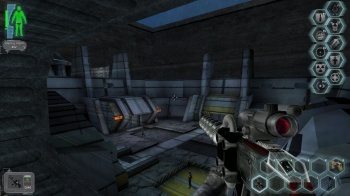 Look no further than Deus Ex for proof: the 13 year old game is still being modded long after the closure of its developer, Ion Storm. The latest contribution is Deus Ex: Nihilum, though to call it a mod would be an understatement. Nihilum provides roughly ten hours of new gameplay, complete with fresh cyberpunk locales and a parallel storyline drenched in conspiracy. Developer FastGamerr bills the mod as a spiritual expansion pack to the original Deus Ex, maintaining its core components while adding flavor of its own. It's not lacking for flavor, either - Nihilum features a two hour soundtrack, over 2,000 lines of recorded dialogue, and a handful of expansive new maps. In keeping with the spirit of the core game, exploration is rewarded with a host of hidden secrets to add a few more hours of playtime to the campaign. Nihilum is the result of several years of development from its creator, and its completion marks his departure from the modding community. Owners of Deus Ex can download Nihilum over at ModDB, though you may want to grab some graphical enhancements while you're there (just in case the nostalgia goggles don't do the trick). It's said that every time Deus Ex is mentioned somebody reinstalls it; I'd say there's a good reason in this case.